César Franck was born in Liege, Belgium. He moved to France and became the organist at the beautiful Saint Clotilde Cathedral in Paris. He wrote many sublime compositions, many of them completely unknown today. "[d'Indy's] loyalty [to Franck] caused him to exaggerate and even dramatize situations at times. His reverence for Franck almost passed the bounds of reason. with the best will in the world, d'Indy, in his book on Franck, gives an overdrawn picture of the saintliness and mysticism of the man. Readers of this book are led to believe that Franck was...far too pure for this earth. No one can blame d'Indy. One invariably has a highly colored picture of one's idols, and it so happens that d'Indy's picture of Franck was rather too roseate in hue." We wonder on what authority Mr. Demuth refutes what d'Indy said, as Demuth had no personal experience of Cesar Franck at all. It is difficult for people to grasp spirituality in a person, but judging from the music that both Franck and d'Indy created, we say d'Indy must have understood that spirituality well. It takes a spiritual person to understand spirituality in another. Corinne Heline called Franck a spiritually illuminated music messenger and wrote that "his inspired music seems to draw heaven closer to earth and to lift earth to heaven. 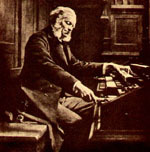 Cesar Franck was a saintly individual who dedicated himself entirely to the noblest meaning and purpose of spiritual music. It is not surprising, then, that much of his inspiration was received from angelic beings. For this reason his music is deemed to possess great healing and revitalizing qualities by those engaged in the profession of music therapy." Franck was considered to be a minor composer by music critics in the 20th Century, a century that idolized negative and shallow music. Now in this 21st Century, it is time to reconsider the great spiritual music created by this gentle French composer. Franck left a large heritage in France among his students. Visit the DoveSong page devoted to them by clicking here. Cesar Franck was born at Liege, Belgium, in 1822 and was the son of a banker. His father was a keen music lover and gave his two sons, Cesar and Joseph, a decent musical education. He wanted Cesar to travel as a virtuoso pianist and placed both sons in the Paris Conservatory in 1836, studying under Reicha. Cesar achieved great success from an early age, and won first prizes in piano, organ, and fugue. It was during the finals of a sight-reading competition in Paris that he impressed the judges by breaking the rules when he transposed a piano fugue concerto from Eb to C. For this, he was awarded a special 'Grand Prix d'Honneur', thus establishing his potential as a promising pianist. Unfortunately, Franck's career as a pianist faded quickly and at age 30, he turned to the organ. Upon leaving the Paris Conservatory, he began to teach and play as a church organist. His brother, Joseph, later also became a church organist, but his career was not as distinguished as Cesar's. For the next forty years beginning in 1858, Franck, being a devout Christian, was the organist at St Clotilde. It was here that Liszt stated that his organ improvisational skills were the greatest since Bach. Franck revived the 'classical' organ playing style in France and his first important series of organ works, called Six Pieces pour grand orgue, came out in 1862. He was hailed as one of the great hopes of French music, and also gained a reputation as a piano and organ virtuoso. The Six Pieces pour grand orgue were his only notable works before the 1880's, when he composed most of the music by which he is known. But even these did not make him famous, and Franck was still considered to be unimaginative as a composer. Franck spent the rest of his life in Rue de Rennes with his wife and four children, moving there in 1865. Madame Franck disliked his music, and their marriage was made even worse when she clearly expressed her hate of the F minor Piano Quintet and the D minor symphony. Franck's music was more recognised prior to the 1880's. In 1871, one of his works was put on the very first program of The Societe Nationale de Musique, and a year later he was appointed professor of organ at the Conservatory. A group of pupils gathered together to advocate his music around Paris. They helped Franck steer French composition toward symphonic and chamber music, and away from the more conservative opera. Franck passed on his ideas of harmony to his pupils, and became well known for his penchant for frequent modulations. At the premiere of his Piano Quintet in 1880, Saint-Saens, the pianist, hated the continual key changes so much that he didn't wait for applause. Franck's Symphony in D minor also attracted criticism for similar reasons. Other 'failed' works include his oratorio Redemption (1873), Les Beatitudes (1869-79) and his oratorio Rebecca (1881). It is said that his first real success as a composer came when his String Quartet was warmly applauded at a concert of the National Society of Music. He died a few months later as a result of a car accident. Unfortunately, it was only after he died that Franck's music became popular. The popular works include: the Symphony, the Symphonic Variations for piano and orchestra (1885), the A major Violin Sonata (1886), his Prelude, Chorale and Fugue for solo piano (1884) and his Prelude, Aria and Finale (1887). The three Chorales of 1890 were composed when his organ style reached its peak, and his Piano Quintet (1878), his tone poems Les Eolides (1875-76), Le chasseur maudit (1882), Les Djinns (1884), and Psyche (1887-78), and even the D minor Symphony helped to establish his growing reputation. Organists still perform his Chorales and the Grand Piece symphonique. The Wagnerian chromaticism of Franck's harmonies, along with his extensive use of cyclical form (in which a single theme recurs in each section of a work, often modified or transformed), confused audiences of his day, but his music is now recognized for its harmonic richness and structural innovation. The D minor Symphony is generally regarded as the French answer to the monumental symphonies of Bruckner. Unbelievablely beautiful. Stay clear of the many 'shortened' versions. This composition must be performed by both Orchestra and choir. Long ridiculed, this is a glorius work, filled with the highest praise and glory. A great work of spirtual music. Franck was a master of organ composition, and it is in the field of organ that he is perhaps the best known. We recommend purchasing one of the CD sets that contains all of his organ music. After you have the CDs, start by listening to Prière. This is the 'full' version. For years, there was only a 'shortened' version (containing an instrumental extract, often known as the Redemption Symphony) available of this work. An early mass, simple, yet beautiful. This is Franck's very famous violin sonata. Franck wrote a beautiful string quartet.